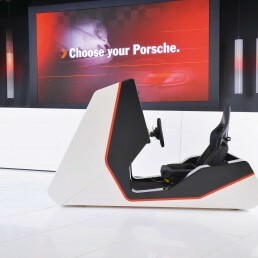 For the past four years, VISCHERS has been managing and developing high-end racing simulators for Porsche AG’s Branded Entertainment department. The, in the meantime, second generation of the Porsche Racing simulators 2.0 successfully unites the fascination of motorsport with the current Porsche production models and makes it possible for young and old alike to interactively experience the brand core. 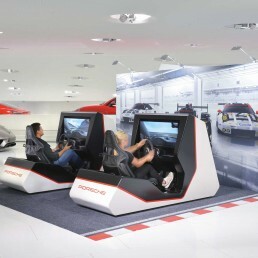 In addition to the use of the simulators as an eyecatcher and activation impulse in the Porsche Museum and in the Porsche centres, the simulators have been successfully used worldwide at Porsche events and races – all managed by VISCHERS. In the best company at the Porsche Museum in Zuffenhausen. Conception, coordination and implementation the worldwide deployment of simulators at events. Branded Entertainment - Individual branding of vehicles by integrating customer and partner logos. Navigate through the website with one click on the screenshot.